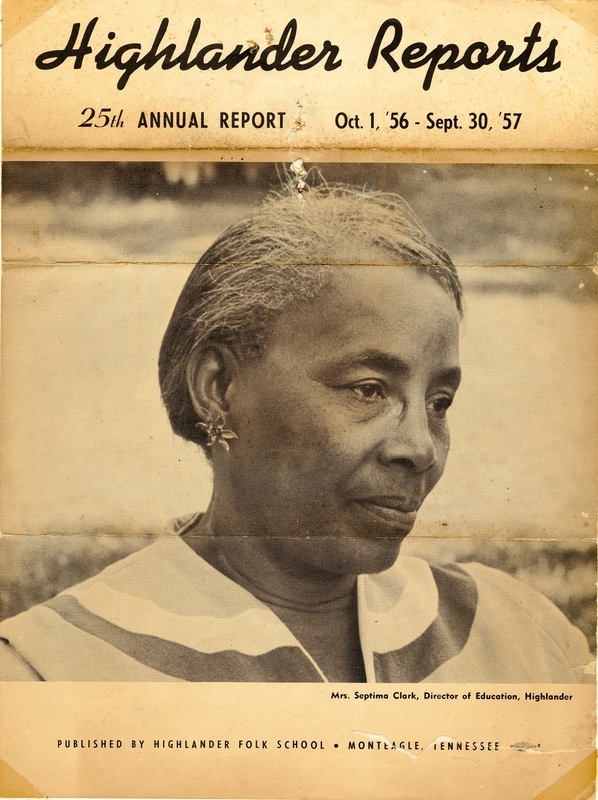 Septima Clark on the cover of the Highlander Report, 1957, Septima P. Clark Papers, courtesy of the Avery Research Center. Though Septima Clark is included in Charleston's public history landscape, current memorials often depict her as an elderly woman who rendered great service to a more distant civil rights movement, as well as to the city. Thus sanctified, she is harmless. We need a much fuller portrait of Clark’s radicalism throughout her life to appreciate her contributions to the black freedom struggle. In this context, “radicalism” must be understood within the framework of the African American experience in the Jim Crow South, as black southerners attempted to identify and solve the constant racial injustice they confronted. For Clark, expressing radicalism meant confronting the white supremacist power structures of segregation that devalued African American life and severely curtailed political, economic, and educational opportunities for black people. Shying away from portraying Clark as a radical in an interpretive context misses the opportunity to reaffirm one of the most democratic of all American traditions: the right to dissent. 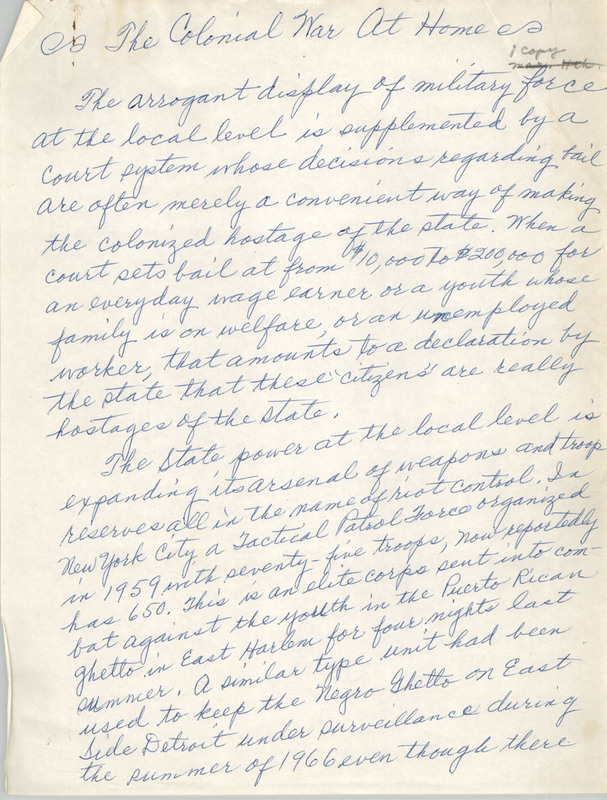 "The Colonial War at Home," handwritten essay by Septima P. Clark, n.d., Septima P. Clark Papers, courtesy of the Avery Research Center. CLICK HERE to view larger image and full essay. Clark paid a high price for her activism during the Cold War. Many people suspected she was a Communist due to her uncompromising stance for integration and her affiliation with the Highlander Folk School in Monteagle, Tennessee, which segregationists labeled a “Communist training school.” In the early 1950s, most black Charlestonians—even her sorority sisters in the local Alpha Kappa Alpha chapter—feared associating publicly with Clark. Moreover, when the Charleston School Board fired her in 1956 due to her open membership in the NAACP, she lost her retirement benefits after forty years of teaching. Though Charleston currently features various markers to Clark’s life, most visitors to the city would be hard-pressed to find any depiction of this radical woman. 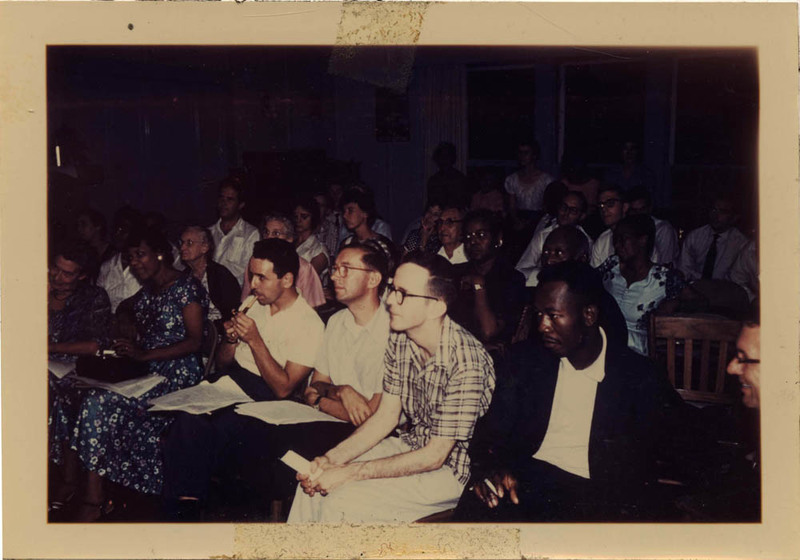 Program at Highlander Folk School, Monteagle, Tennessee, 1959, Septima P. Clark Papers, courtesy of the Avery Research Center. Many people suspected Septima Clark was a Communist due to her uncompromising stance for integration and her affiliation with the Highlander Folk School, a social justice leadership training school.